An updated version of our popular Lisette Portfolio Dress pattern, this easy-going pullover can be made in two lengths—as a tunic or dress. Both styles feature a flattering V-neck and crossover neckband with a softly gathered front detail and options for either a kimono-style short sleeve or a three-quarter-length sleeve with contrast cuff. 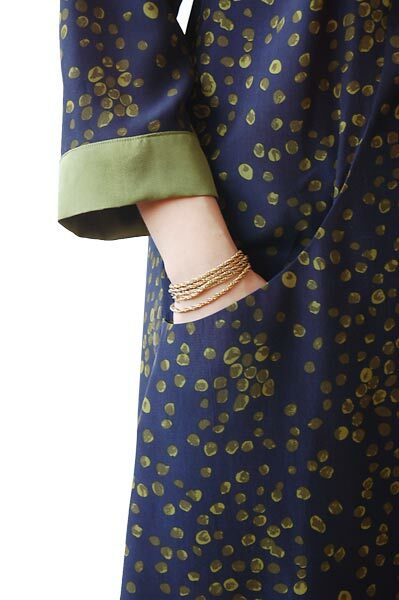 The dress includes unique on-seam pockets in a flattering curved seam. Share your photos on Instagram with the hashtags #cappuccinodress and #lieslandco. This pattern works best with light- to medium-weight woven fabrics like quilting cotton, chambray, lawn, shirting, poplin, broadcloth, sateen, voile, linen, washed silk, and rayon. Bust 33 1/2" 34 1/2" 35 1/2" 36 1/2" 37 1/2" 39" 40 1/2" 42" 43 1/2"
Hip 39 1/2" 40 1/2" 41 1/2" 42 1/2" 43 1/2" 45" 46 1/2" 48" 49 1/2"
Dress Length* 35 1/2" 36" 36 1/2" 37" 37 1/2" 38" 38 1/2" 39" 39 1/2"
Tunic Length* 26 1/4" 26 1/2" 26 3/4" 27" 27 1/4" 27 1/2" 27 3/4" 28" 28 1/4"
* Measured from neck at shoulder. 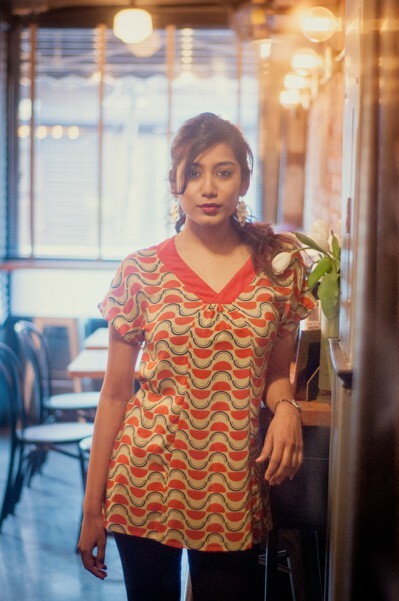 Sewed this dress up in a cute patterned cotton. I made a size 8 - I typically wear a women's medium and I am small busted (A-B cup). My concern always with women's clothes is how wide they are in the shoulders as I have broader than average (but not insanely broad) shoulders. This fits great! 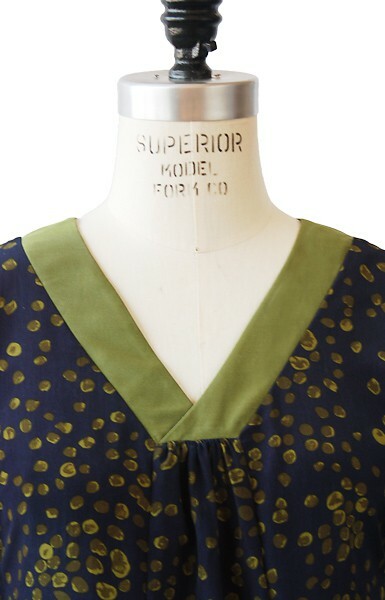 I LOVE the neckline - super cute with a coordinating fabric. And I love the front pockets - I always need somewhere to stash my office keys while at work! 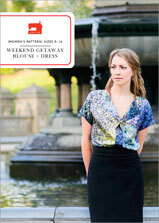 I am currently sewing a second one in a fun summer knit and altering the sleeves to be sleeveless. Great pattern!! I am very much a beginner but I managed to tackle this tunic top without too many problems. It looks lovely with contrasting colours for the neckband, and I made up some bias tape from the same contrast material and used it to finish off the sleeves and bottom edge - not in the pattern but it looks great! All I would say is to allow some extra fabric when cutting the underarms, then wear and pin it before you sew, to make sure there's no bunching - mine needed half an inch more than the pattern said under the arms. Can't wait to make a second one! I bought this pattern after lots of encouragement from my sister who sews extensively and finally decided to start using patterns and loves it and has learned so much. I sew a bit, have been mostly trying to (sometimes successfully create patterns from existing clothes). For a first pattern, I found it very easy (though slow!) to work through. Very methodical and soothing somehow to just follow directions. The instructions were clear. The fit is snug. I am small busted and can get away with a size 12 but it is certainly much snugger than what I usually wear. I sewed it up in muslin for a trial. Like the other reviwers I don't like the V-neck at all and am altering it on my next version which will be of linen. I hope I can pull that off. Thanks for providing this pattern. I did decide to buy another Liesl pattern after enjoying this one so much. Only works for certain body shapes! I've just completed the side-seams and tried on my cappuccino dress for the first time - I have really enjoyed putting it together and found that the instructions were very clear and helpful - altogether very well designed. However, there's no way around this - this dress looks terrible on me. I made up a size 14 with the large bust adjustment, in linen. I would describe the fit of this dress as 'snug'. I had envisaged it as being a somewhat roomy design - no. It really looks like it needs a dart at the side of the bust - at the moment the fabric is pulling uncomfortably across the bust, to the point of distorting the seam in the armpit. As a result the gathering in the middle rucks up to form a little shelf! What's more, if you have ANY kind of a belly that you hope this dress will conceal, forget it. The pockets, although beautifully styled, gape because of the snug fit of this dress, and accentuate my belly unattractively. I am 5"6 and the pockets feel a little low on me, too. 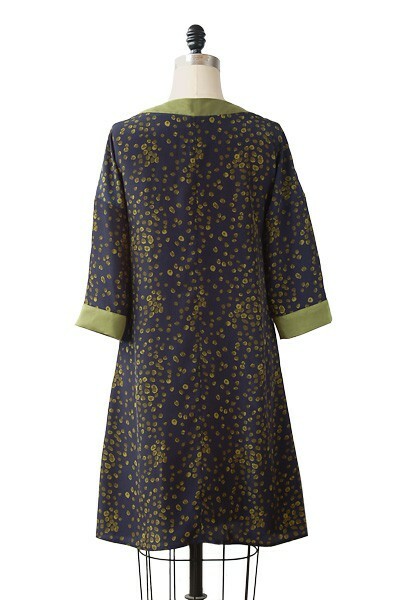 Don't get me wrong, this dress could look beautiful on someone - someone with a small bust who is slender and tall. One consolation is that the linen I chose turned out to be completely see-through when worn, so this dress would have been a failure anyway! Sigh. still a beginner, but afer sewing using a few ebooks, i found this ebook the far best instruction till now. When printing, every peace is seperate and not all on one very big sheat which causes often inaccuracy. then the very detailed instrucion, even explanation of the different stichings, helped me a lot as somebody with not english as mothertong. I like the pattern and will sew it again, just the next time i need to make the bust extention even as a "B cup" because in the front it does not fit good (size 12). Maybee i should have chosen one size bigger, but the rest is fits perfectely. Thanks for this nice pattern! 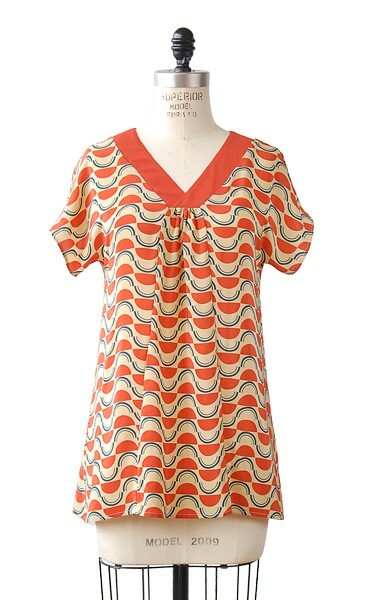 I saw this tunic in a magazine and it was cute so I decided to buy it. I am not sure about the sizing as there is only 1.5" ease for all the sizes. A size 12 is for a 39" bust but it finishes 40.5". I like my clothes with more ease so I have this cut out in muslin to see how to adjust. I also purchased the Cinema dress and the Gallery tunic. Their ease measurements appear to be more in line with other pattern companies. Made this dress up in a linen type fabric. The dress made up well and the instructions were easy to follow. I am tall so I easily altered the length of the sleeves and the dress itself. I also altered the bust for a 'fuller' bust and found this easy considering I have never done it before! I chose the design because it is a little more unusual than most of the designs in the UK. I am very pleased with my purchase and will be keeping an eye out for similiarly unusual designs. I love this pattern! I just finished making the tunic, using a very nice rayon from HawthorneThreads. The fit is great, the instructions are great--I was a bit nervous about the collar (neck band), but it went together easily and looks professional. This was my first Liesl and co. pattern, but I will probably try another one. I searched like crazy to find this pattern and was glad to see this. However, a V neck is NOT universally flattering and I'm going to try creating the round neck version. Easy to follow pattern. Love my new summer dress. This is a great pattern for beginner because the instructions are easy to follow and the results is really impressive and satisfying. I have made a tunic and it took around 6-7 hours of work but I am sure a more experienced seamstress will sew this in a couple of hours. I have been looking for this type of v neck for a while. Will love wearing this all summer. A great vehicle for fun contrasting fabrics! Would love to see these patterns in larger sizes, as it took some time to alter this to fit me. (4 stars for sizing limitations) Well worth it though, in a cotton voile, next up, gauze and perhaps a dress in a cheerful lightweight print! The Cappuccino dress pattern was very easy to put together. I made a muslin firstly because I didn't know how I'd like it. I don't like how I look in a v-neck but otherwise it's a pretty dress. I sure wish I could get a hold of the portfolio pattern because I know I'd love it. Maybe I can alter the neckline myself. 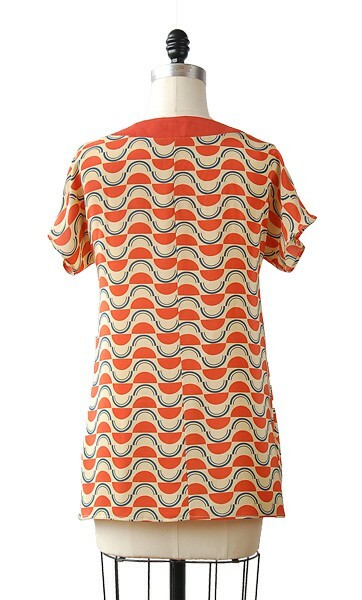 The tunic was very quick to make and the distinctive neckline was explained vey well. Very comfortable to wear on a hot summer day. I haven't used the pattern yet. I am presently working on Christmas projects. I did take a look at the pattern and I have to say it looks like a very well designed pattern with great directions. I plan on making the dress after the holidays are over. I m so glad I bought the cappuccino dress. The style is very flattering. I searched for a year for a pattern of the portfolio dress, but it was discontinued. It was easy to understand and went together nicely. I've bought fabric to make three more. I searched high and low for a copy of the Portfolio, which was discontinued. 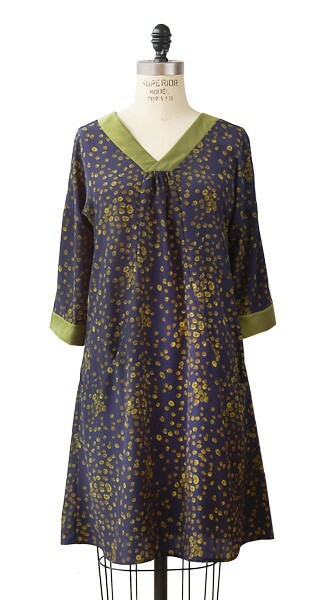 It was a hefty sum when I found it, but I was happy to have it, and happy with the dresses I made. I decided to get the Cappuccino for the neckline variation, but find the shape of the entire dress more flattering. The neckline certainly helps with a fuller bust, but the shape of the dress on the whole is better too. I'm glad I went ahead and bought it! Loved the pattern. Pieces fit well, instructions clear, final product a little querky and fun! I am sewing the dress now. I found the instructions and additional sewing tips to be very helpful. I was able to customize the fitting using the sizing markings quite easily. I am confident that I will be happy with the result. 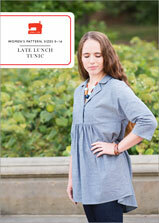 I bought this pattern with the intention of altering it as a maternity shirt/tunic. I made it and the pattern and directions were great. My maternity alterations came out ok: it fits the belly (adding room in the front panel), but looks a bit awkward in the bust. I probably didn't make enough of an alteration. The front gathers make up for the lack of room, so I do fit in it, but spreads awkwardly, rather than falling gracefully down the front. It would be helpful to have better direction on the bust adjustment for folks over a D cup - which I imagine is common in maternity alterations. I was a bit lost trying to calculate for an H cup. My only other comment (not sizing related) is that I highly recommend folks use a contrasting color fabric in the neckband. 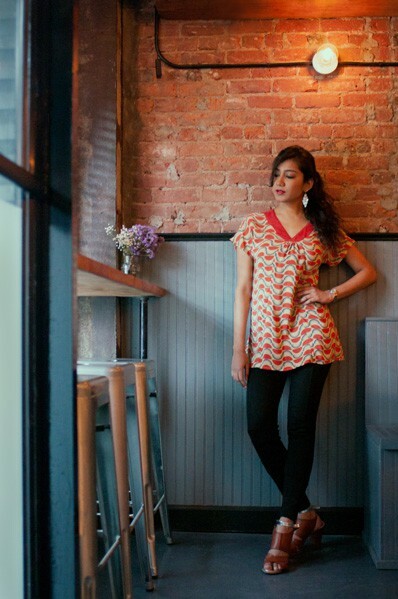 I made the tunic without the sleeves and used the same fabric for the neckband as the rest of the shirt. It reminds me of scrubs, honestly, which I don't love. Next time I am going to use a different color in the neckband and I think it will look better. In general, however, I am very satisfied with this pattern. I have only been sewing clothes for a short time and I was able to complete this shirt in a week (without making a muslin). It's even been in the wash and hasn't fallen apart. Ha! Thanks! As always, the Cappaucino dress pattern did not disappoint. 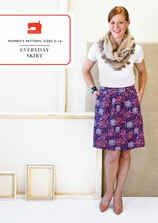 Like other patterns under the Liesl & Co. And Oliver & S umbrella, the pattern was meticulously designed. I love the dress I made! And I have another cut out and ready to sew. Love these patterns. Easy to make and too cute for words. 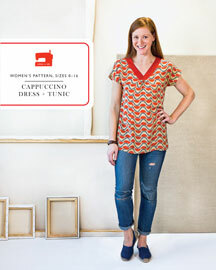 Discussion on the digital cappuccino dress + tunic sewing pattern from the Oliver + S Discussion Forums. Find and share more photos on Instagram using the hashtags #cappuccinodress and #lieslandco.